Augusta Waddington was born at Ty Uchaf on March 21st 1802 - the youngest daughter of Benjamin and Georgina Waddington, who had moved to Llanover from Nottingham in 1792. In December 1823, Augusta married Benjamin Hall (1802 – 1867) of Abercarn. He was an MP for 22 years until 1859, when he was raised to the peerage. Whilst in London, Benjamin Hall was appointed Commissioner for Works, but he did not forget his allegiance to Wales and he fought for Welsh cultural interests, such as upholding in Parliament the right of the Welsh to have the services of the Church ’rendered in their own tongue…’, and insisting that any new Bishop should be Welsh speaking and live in Wales. In 1828, Sir Benjamin and Lady Hall commissioned Thomas Hopper (1776 - 1856) to design a house. They intended their new home, known as Llanover House, to become the recognised centre of all their activities, particularly the promotion of the Welsh language and culture. Lady Llanover died in 1896 having outlived her husband by 29 years. She is buried alongside him at St Bartholomew's Church in Wales, Llanover. After the funeral, Betha Johnes of Dolaucothi, a friend of hers, wrote in a letter ‘it is best she should be at peace and at the age of 94, she died as she had lived, a worker’. The close association of the harp with dance had made it offensive to puritanical non–conformists and by the 19th century the triple harp, in particular, had become scarce. Lady Llanover is without doubt the most important figure in the survival and consequent revival of interest in the triple harp and its Welsh traditions. 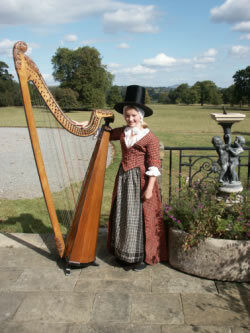 Lady Llanover gave permanent employment on her estate to Welsh players of the triple harp at Llanover House. The first of these was John Wood Jones (1800-1844) who was employed as the household harpist from 1826 until his early death in 1844. He was succeeded by the partially blind triple harpist, Thomas Griffiths (1815 –1887) who was also known as Gruffydd. He, in turn, was succeeded by his widowed daughter Susanna Berrington Gruffydd-Richards (1854 – 1952). Lady Llanover collected Welsh folk music and encouraged others to do so, particularly Maria Jane Williams (1795 – 1873), whose collection ‘The Ancient Airs of Gwent & Morgannwg’ won the prize in the 1837 Eisteddfod. This collection was published with Lady Llanover's help in 1844. Lady Llanover encouraged others including Bassett Jones of Cardiff, Abraham Jeremiah and Elias Francis both of Llanover to manufacture harps, some of which she donated, or persuaded her friends to donate, as prizes in the Cymreigyddion Eisteddfodau held in Abergavenny. Lady Llanover invited noted composers and Welsh musicians to stay and perform at Llanover House. These included John Parry (Bardd Alaw 1776 – 1851) and his son John Orlando Parry (1810 – 1879), John Thomas the harpist (1826 – 1913), Brinley Richards (1817 – 1885) and Joseph Parry (1841 – 1903). From 1826, when Lady Llanover first attended an eisteddfod at Brecon and met Carnhuanawc (the Revd. Thomas Price), she both sponsored and entered competitions. At the Eisteddfod held at Cardiff in 1834, she won the prize for an essay entitled 'The Advantages resulting from the Preservation of the Welsh language and National Costume of Wales'. Her nom-de-plume on this occasion was Gwenynen Gwent (the Bee of Gwent), the bardic name by which she subsequently became known throughout Wales. From 1834-1853 she was the inspirational force behind the famous Eisteddfodau held in Abergavenny by the Cymreigyddion Society. Lady Llanover obliged her estate workers, tenants, and even her aristocratic guests to wear the traditionally made and styled Welsh rural clothes. Her winning essay from the 1834 Cardiff Eisteddfod was published with a series of coloured illustrations of Welsh costumes, reproduced from water-colours painted by herself. She sponsored a competition at the Abergavenny Eisteddfod in 1853 ‘to authenticate the real old checks and stripes of Wales and to preserve them’. She drew illustrations of her ideas of Welsh costume, attributing them to specific regions of Wales. In this way an internationally recognised form of Welsh National Costume was created, although her main motive is thought to have been to save the Welsh flannel and woollen industry which was under threat from imported cotton. With this in mind, she built a Welsh woollen mill on the Llanover Estate. Lady Llanover ensured that each of the properties on the estate had Welsh names, and required all her tenants and estate workers to speak Welsh. As it became increasingly difficult to find local Welsh speakers, Lady Llanover encouraged people for whom Welsh was their first language to move from Cardiganshire to Monmouthshire. The Halls reinstated ancient Welsh customs such as the Mari Lwyd at Christmas and the Plygain, followed by the Calennig or Kalend gift on New Years Day. On Sul y Blodau (Palm Sunday) everyone dressed the graves in the churchyard with flowers. In addition, there were the Beltane Fires on May day, the gathering of mistletoe on St. John’s Eve, Harvest Festivals and Hallowe'en. Annual prizes of Welsh costumes were given by Lady Llanover to pupils in Llanover School for their knowledge of Welsh customs. Through her book ‘The First Principles of Good Cookery’ first published in 1867 she promoted traditional culinary, horticultural and domestic practices. Helped to form the Abergavenny Cymreigyddion Society & the Welsh Manuscripts Society (1862 - 1874). Edited six volumes of ‘The Autobiography and Correspondence of Mary Granville, Mrs Delany’ in 1861 & 1862. Helped to found Llandovery College in 1847. Endowed churches and chapels where all services were to be in Welsh. Started a pedigree flock of Welsh Black Mountain Sheep in Llanover Park.